Ian Chappell always stresses the importance of the number three position in Tests. A player at that position needs to be extremely versatile and able to adapt his game according to the situation. He should be able to bat defensively if an opener has fallen cheaply or press home the advantage if the openers have given a quick start. Chappell also advocated that the best batsman in the team should bat at that position. In the late 90s, he suggested that Sachin Tendulkar should bat at number 3 and set the tone of the innings, rather than come in when India were 2 wickets down with just a few runs on the board and repair the damage. The great number 3 batsmen over the years have included Don Bradman, Viv Richards and, for India, Rahul Dravid. When Dravid retired from Tests in January 2012, India felt that they had an ideal replacement in Cheteshwar Pujara. 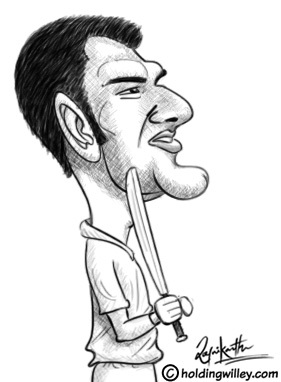 However, does Pujara deserve to be mentioned in the same breath as Rahul Dravid? There is no doubt that Pujara has done quite well at number 3, despite having a horror run in the first 2 Tests in the ongoing series in South Africa. His strength is that he has loads of patience and does not play any rash shots. He tires the bowlers and makes them bowl to him rather than chasing wide deliveries outside the off-stump. He is similar to Dravid in the sense that he has an impregnable defense but doesn’t possess the attacking nature and range of shots to batter the bowlers into submission. How do his numbers stack up in comparison to Dravid? The following table gives Pujara’s record in different conditions across the world. He has played 56 Tests and has a decent overall record, even though his numbers are heavily skewed by favorable conditions at home. His home record would be the envy of any batsman, but his numbers away from home make for extremely poor reading. When you take his record in the SENA countries (South Africa, England, New Zealand and Australia) as Harsha Bhogle calls them, his average is a mediocre 27.19. He does not average in excess of 35 in any of the 4 countries. His higher average in South Africa is mainly due to a 153 on a flat pitch at the Wanderers, where South Africa nearly chased down a target of 458. If you take away his 3 centuries in Sri Lanka, he has just a solitary century away from home. There is no doubt that Pujara is a colossus at home. Of the 36 Asian batsmen who have scored a minimum of 2,000 Test runs at home, Pujara has the 3rd best batting average (62.97) after Mohammad Yousuf and Virat Kohli (65.25 and 63.5 respectively). He is ahead of greats like Sachin Tendulkar, Kumar Sangakkara and Mahela Jayawardene and Dravid himself. Pujara is still only midway through his career, so let us compare his numbers to Dravid’s after his first 56 Tests, and also Dravid’s overall Test numbers. (Dravid’s overall numbers include one Test played for ICC World XI against Australia). After 56 Tests, Dravid is just marginally better than Pujara but had played as many home Tests as away (28 each). He also averaged a stupendous 56.8 away from home in this period. At the end of his career, he averaged an incredible 53.03 away from home. Dravid averaged 63.83 and 68.8 in New Zealand and England and 41.64 in Australia. The only blemish in his record is in South Africa, where he averaged 29.71. However, at the end of his career he had scored 10 centuries in the SENA countries at 48.54, which are brilliant numbers. Dravid is streets ahead of Pujara in the SENA countries even though Pujara is brilliant at home. The purpose of this analysis is not to belittle Pujara but point out that he has a long way to go before he can be considered a great player. Kohli has repeatedly said that he wants to see intent from his batsmen. In the second Test at Centurion, Pujara became the first Indian to be run out in both innings of a Test. In the first innings he went for a non-existent single and was run out by a considerable distance. In the second, even a frantic dive was in vain. This was even more disappointing when you consider that he has dodgy knees, so running between the wickets is not his forte. Taking into account the match situation at Centurion, there was no need to take a risky third run in the second innings. This shows his current state of mind. Of course, these things tend to happen when a batsman goes through a bad patch. Kohli had even dropped Pujara after he scored 46 off 159 balls in the second Test in the West Indies, where he was run out because he was displeased at his low strike rate. He missed the third Test but made his way back into the team for the 4th.